Visual storytelling often moves readers more than words ever could: powerful images not only make the news, but they can also prompt collective action to face a given challenge. With the rise of digital connectivity, there has never been a better time to use the power of photography. And yet, when the challenges of today are more intertwined than ever, and billions of photos – real and fake – are shared online everyday, what does the future of photojournalism look like? Emerging initiatives that not only harness the power of photography but also integrate data and research might serve as a rallying call to catalyze viewers into action on behalf of the greater good. As a journalist and photographer, I have spent much of my career capturing stories of inequality, corruption and man-made tragedy across East Africa and the United States. From crouching under cars to photograph dust storms in drought-stricken northern Kenya, to staying in secret safehouses to document the plight of gay and transgender Ugandans, I have used photography as a catalyst to inspire action on a global scale. Photographs have been long been a central part of news reporting. From the long-exposure glass plate cameras to the development of the compact 35mm camera, journalists have sought to document reality and bring life to otherwise static stories across the planet and for the planet. These days, the importance of photography often runs parallel to the story itself. From the largest daily to the smallest monthly, nearly every newspaper publishes their lead story with an accompanying photo. And even journalists rooted in the hard-nosed techniques of an investigative news reporter realise that visual storytelling often moves readers more than words ever could. From the jungles of the Democratic Republic of the Congo, where Brent Stirton photographed a group of grief-stricken men carry a makeshift gurney holding Senkwekwe, a 500-pound silverback mountain gorilla who was slain during the region’s ongoing and brutal conflict, to the cracked, wind-swept landscape of Somalia, where James Nachtwey documented the inhumanity of the 1992 famine that killed 260,000 people, to Eddie Adams’ 1968 image of a South Vietnamese National Police Chief holding a pistol to the head of a Việt Cộng captain, photography has shaped history and shifted perspectives on events that would otherwise be forgotten. These images not only made the news, but gathered international attention around important stories, and prompted collective action to face a given challenge. Stirton’s documentation of gorillas led to a legally binding treaty to protect the endangered animal in nine African countries including the Congo. Nachtwey’s image of the woman being carried in a wheelbarrow is credited with raising 250 million dollars for The International Committee of the Red Cross and helping save 1.5 million lives. Adams work bolstered antiwar efforts that helped end U.S. involvement in Vietnam. With the rise of digital connectivity and smartphones, there is no better time to use the power of photography to shine a light on the thousands of quiet tragedies waiting to be uncovered around the world. How does one make a photograph that can shift policy and move minds? From composition, to lighting, timing and even mathematical theories, there are many factors that, when combined, can make a good photo. Photographs must also be timely, truthful and newsworthy; otherwise they’re not considered photojournalism. But at its essence, photojournalism is a tool for simplifying the complexities of a story into a single frame and providing a clear narrative that encapsulates the emotional, physical and mental dynamics of a story while maintaining the accuracy of the situation. Beyond the technical beauty of an image is also a deeply emotional and subjective experience. Such images often portray a sense of vulnerability and softness within harsh circumstances, or juxtapose feelings of power against powerlessness. They connect humans through universal emotional experiences like love, loss, pain and most importantly, empathy for the subject. But what separates good photography from great is its ability to capture a brief moment in time that can be extrapolated into a larger experience of collective humanity – essentially, of capturing the individuality of mass tragedy. A daughter’s grief as she watches a burial team collect her father’s body at the peak of Liberia’s Ebola outbreak, the fragility of a single emaciated Polar Bear foraging for food in the midst of global warming, a frightened Afghani girl posed in front of a bullet-riddled wall, these images illustrate the individual impact of complex and often intangible tragedies. Despite the importance of photojournalism, it is unclear what the future of the industry will be, and what role photojournalism can play in addressing some of today’s greatest challenges – environmental degradation, climate change, ecosystem collapse and their impact on humankind. Today, more than half the world’s population has access to the Internet and billions of photos – real and fake – are shared online everyday. Audiences are more immune to the power of images, and less likely to trust images they know might have been manipulated. The great photographs of the past were made in a time when newspapers provided the world’s news feed, when readers waited with bated breath for the morning and afternoon editions to hit the stands. They were made when crises were relatively contained in time and space, and when newspaper budgets were bursting. Today’s global challenges are increasingly complex, intertwined and multilayered; capturing those intricacies, providing actions to address them and maintaining the world’s attention at the same time is an increasingly difficult task. As photojournalists, we know how to reveal emotions in the face of a person confronted with a challenge – but the story of humanity at risk is not a story of individual failing: it is collective failure to cooperate. What does a picture look like that highlights not individual suffering, but a call to action for institutions to collaborate? While photographers will continue to grapple with that question, glimpses of new initiatives aimed at addressing a greater call to action are emerging, albeit slowly. PhotoVoice, a participatory photography program, supports marginalized communities to respond to global crises through photography. Wildlife researchers in East Africa are combining GPS-tracking cameras and user-generated photography to identify the role of climate change and ecosystem collapse on animal migration trends. 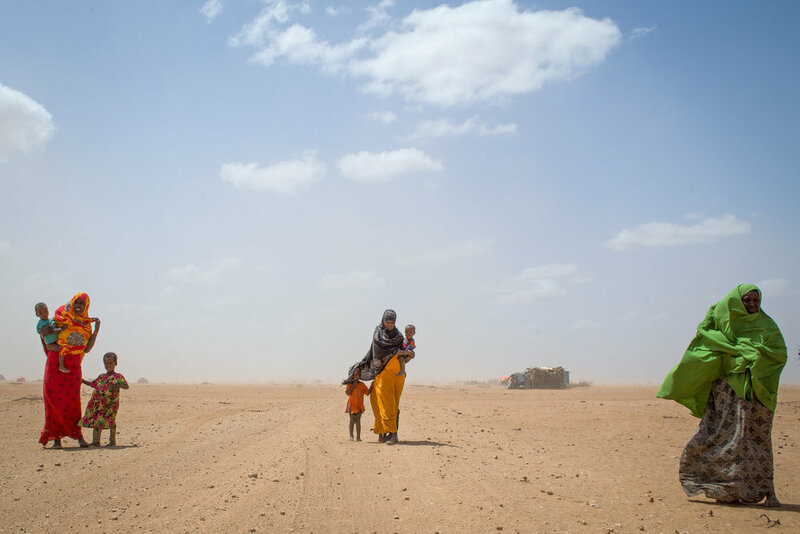 Technology specialists are creating apps that help refugees report infrastructure and governance failures inside sprawling camps by using a location pin and photographic documentation. These initiatives are not only able to harness the power of photography but also integrate data and research to show the scale and impact of environmental destruction. Still, there are no simple answers to solve the immense global challenges ahead of us. Climate change, pandemics and war are interconnected and multi-layered, and so are the solutions to solve them. While there is no one-size-fits-all model for impactful photojournalism, nor do most photojournalists believe their photo will single-handedly save humanity. But it is clear that photography can be used as a rallying call to catalyze viewers into caring and acting on behalf of the greater good. As photojournalists, it is our role to seek out those who have been silenced, to document tragedy and to share our truth to the world. But our viewers also have a job in front of them: to engage with the world through our photography and to act on the stories we’ve so tirelessly fought to share.